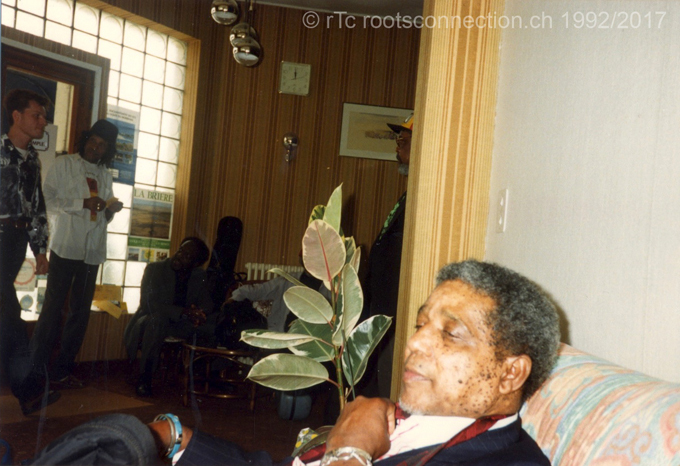 Before leaving to the festival, I took my first pictures of the Skatalites in the Hotel lobby. The mood was easy, because last night, was a brilliant show with maximum respect allover. 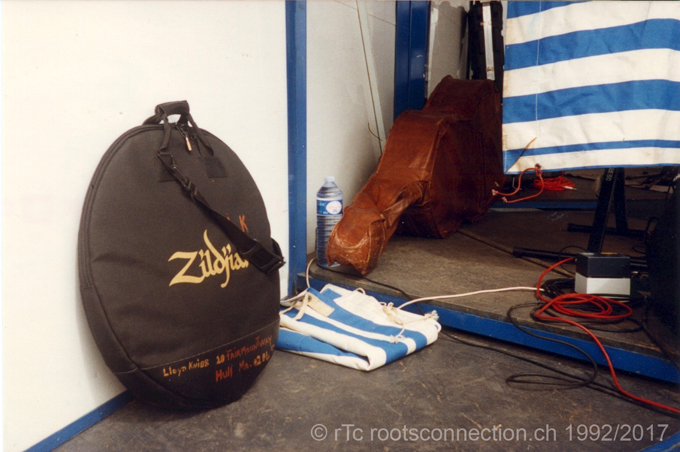 And today was the last show of the Euro Tour 1992. Before noon we went back to the Festival area with the taxi-bus. Nobody recognized anybody anymore. What a difference to yesterday. 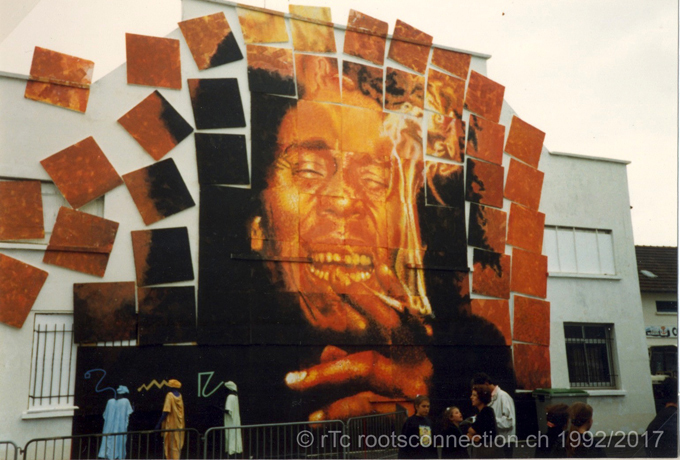 The festival welcomed us with Bob Marley. 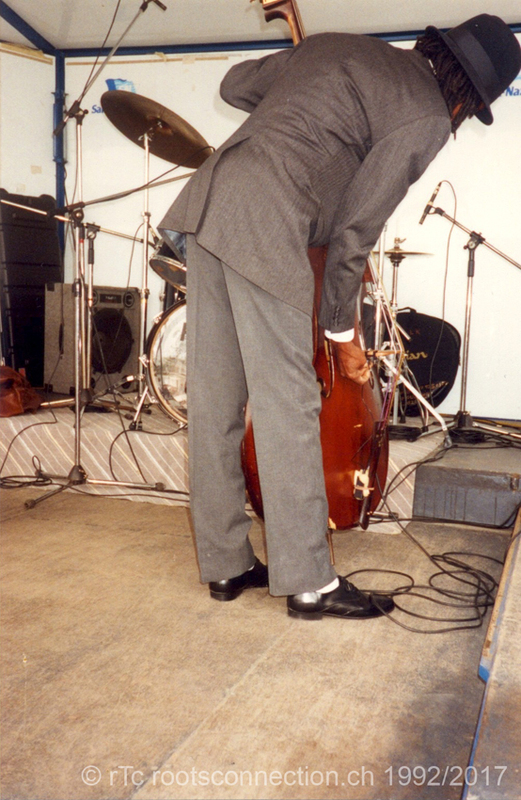 The stage didn’t look like it was good enough for THE SKATALITES. 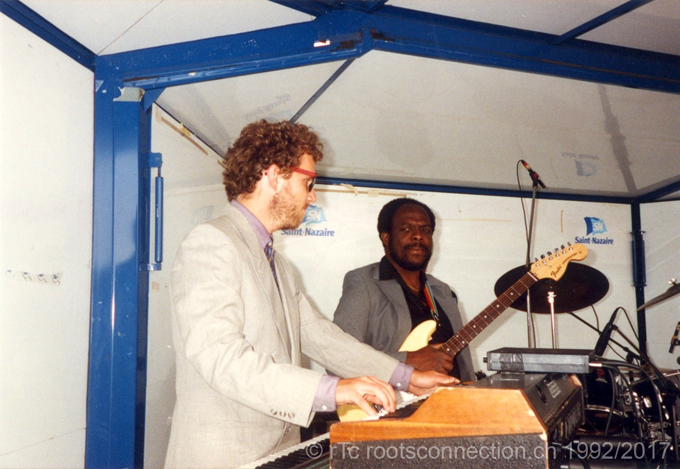 I mean, it was a good stage for an unknown band, but Linton Kwesi Johnson wouldn’t play on that stage! Never ever. 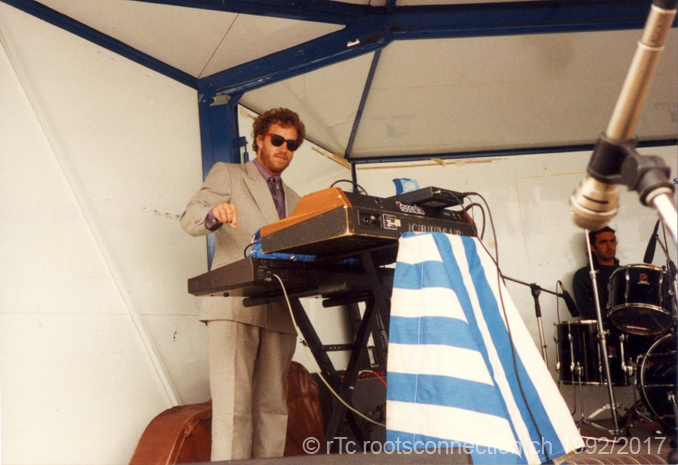 Nobody of the band was really hot to play on that stage. It wasn’t easy for Vin to tell them, they had (!) to play. But first, we all went eating. It was an improvised kitchen. Tommy McCook and I weren’t in the mood to get the food right away, so we started talking a little bit. 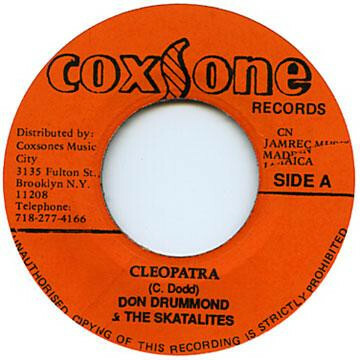 I asked Tommy about the Studio One 7inch of Cleopatra by Don Drummond & The Skatalites. I told him, that I guess, Don Drummond is not even playing on that tune. Tommy said, that this was the producers thing. 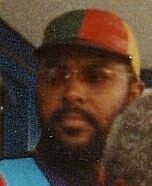 Coxsone broke with Tommy, because he was at Duke Reids Treasure Isle. 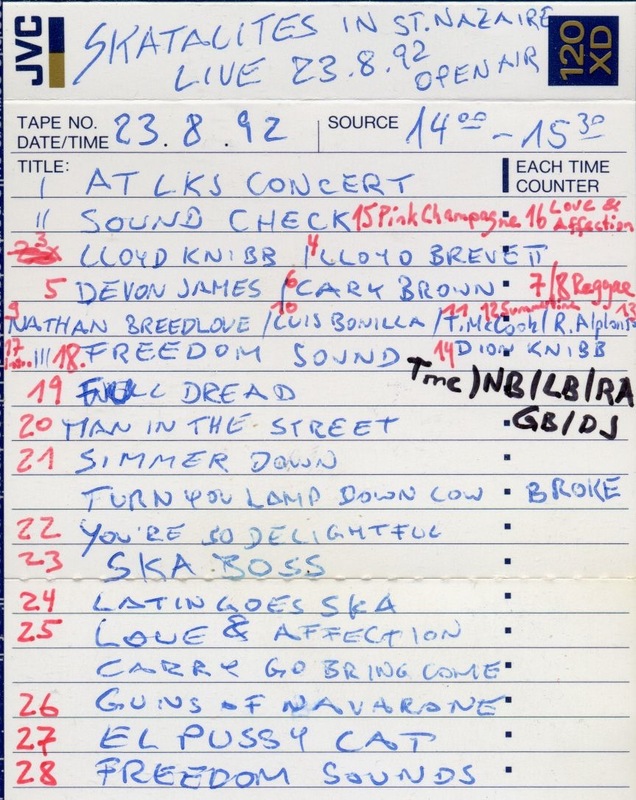 And the tunes he recorded earlier for Coxsone where released under others names. And even the names of the tunes were not the names of the compositions. Tommy told me about his book with his compositions. He was very proud of it. Hopefully someone kept that book after Tommy left this planet in 1998. I guess it must be a treasure of musical masterpieces. Tommy was such a great composer. But he also was talking about his first wife. She was his real love, but she stayed in Nassau, Bahamas. So he had another wife in the USA. I was on turn to get food. I ordered twice fish and rice. But Tommy said, there is too much rice on his plate. After lunch, they started with the sound check. It was kind of a public sound check, because the area around the tiny outdoor stage was open for everyone. 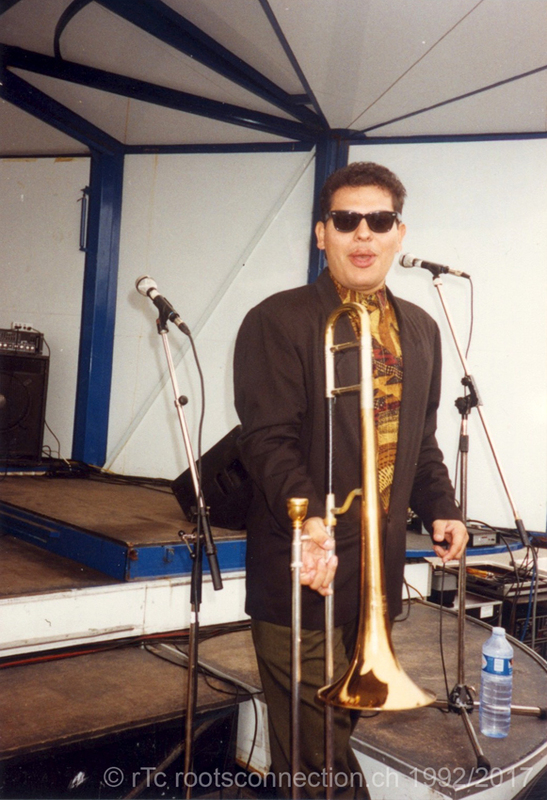 Only a few Ska fans found the place at the right time. Where were all those fans from yesterday night? Still sleeping or already gone home or just missing this second chance to see and hear the masters of Ska? I don’t know. Because I put my bag with the DAT recorder on stage, I also recorded the sound check. 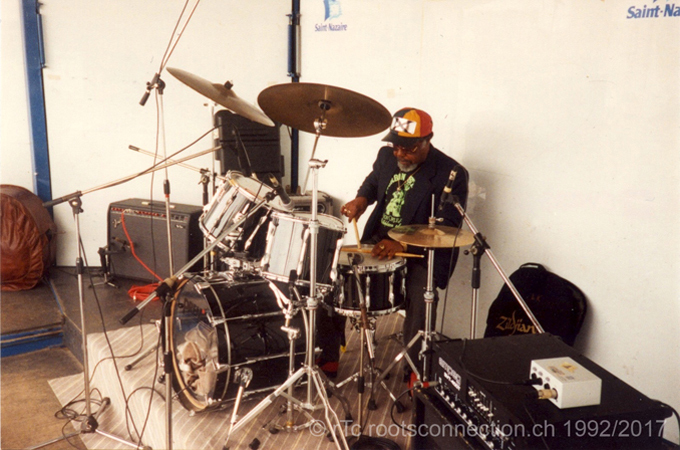 I see it as a great present to everyone, that Lloyd Knibb took his time to get into the drum sound. Maybe someone can play some music around the drumming. I would love to hear those experiments. 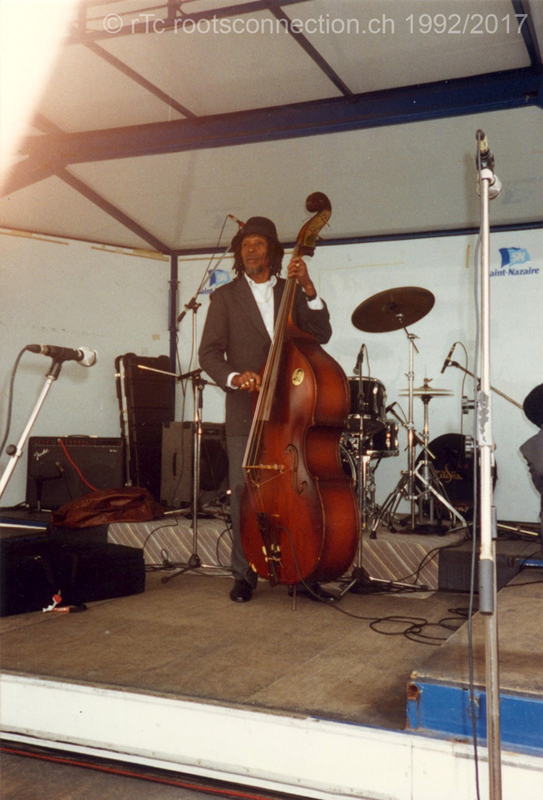 The next sound check was with Lloyd Brevett on bass. I haven’t recorded the bass sound check, I stopped the recording for a while, because I wanted to have enough battery and tape for the show. 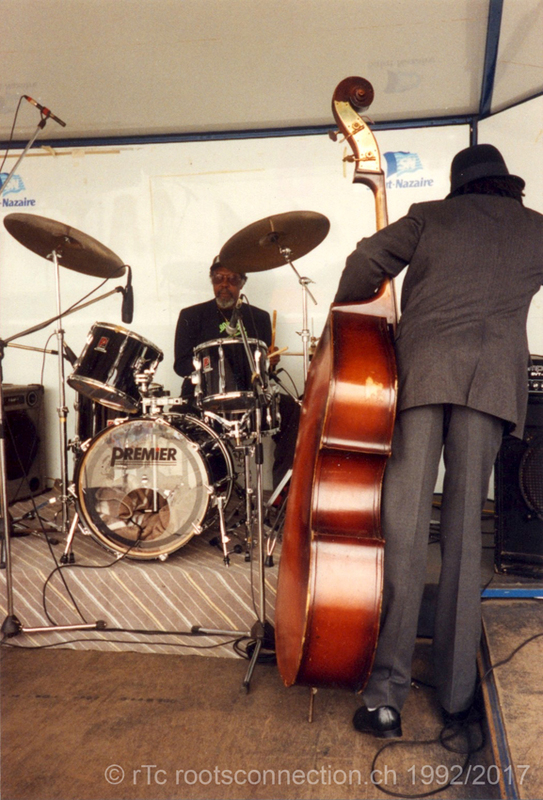 I love this picture so much, because it illustrates perfectly, how straight the double bass and it’s player is standing strong. Devon James is helping with the amplifier. The next sound check was with Devon James and Cary Brown. Cary Brown, Devon James and Lloyd Knibb jammed a little bit in the sound check time. I mean, there was just a little audience, but the sound check was a public thing. I enjoyed a lot. The noise is me, checking, if it really record that cool session. Sorry for that, but I didn’t have enough tape and battery to record everything. Meanwhile Lloyd Brevett left his bass all alone. 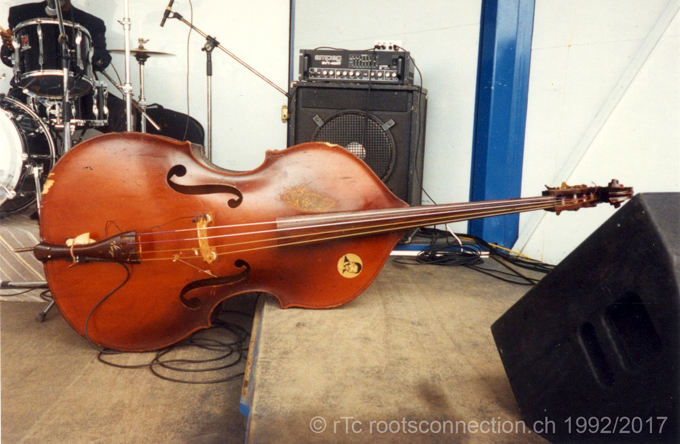 It was the only Europe tour with this acoustic double bass, because this bass was flying from the USA as a person on a reserved seat. 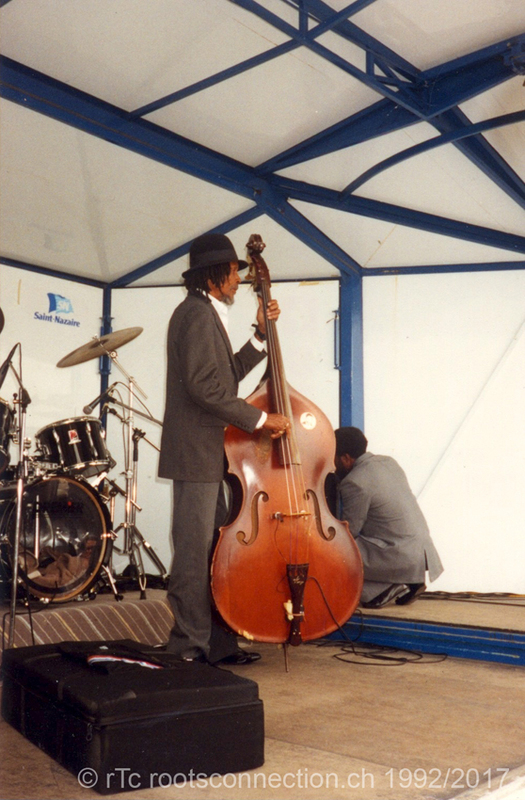 That was too expensive and from then on, Lloyd Brevett took an electric double bass in a case for the European shows, that was small enough to travel as luggage. 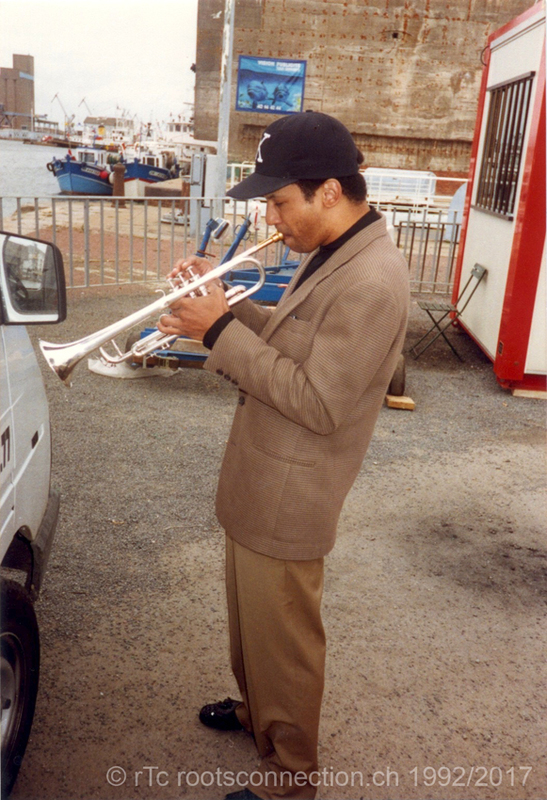 Then the sound check was ready for the horns. Behind the stage, there were Nathan Breedlove and Luis Bonilla warming up. There was no backstage. But I’m not sure, if this area was a public area, I don’t think so. On stage, there were the saxophones sound checking. 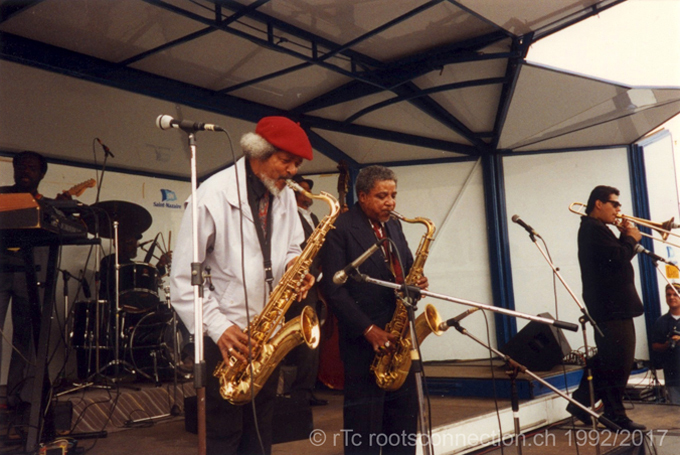 Tommy McCook and Rolando Alphonso. 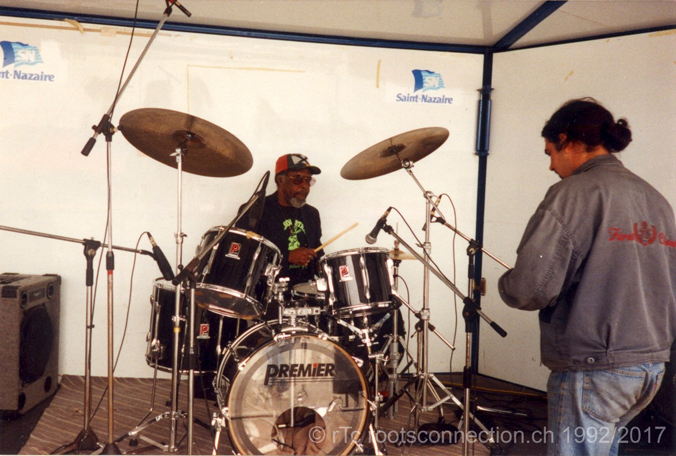 On the left, there is Lloyd Knibb looking at Rolando on the right side, there is Vin watching the sound check. Behind Rolando there is Lloyd and Dion Knibb. Sorry Dion, but this seems to be the only picture I have made. I love it! Tommy McCook took time for the sound check. It was such a great moment, when the two tenor giants looked at each other. I love this picture very much. Then Luis Bonilla sound checked as well. After them all, it was turn for the microphone and Dion did some numbering check. Then the whole band played Pink Champagne (solos: Tommy, Nathan, Rolando, Luis). At the end you can hear the applause. It’s still sound check! 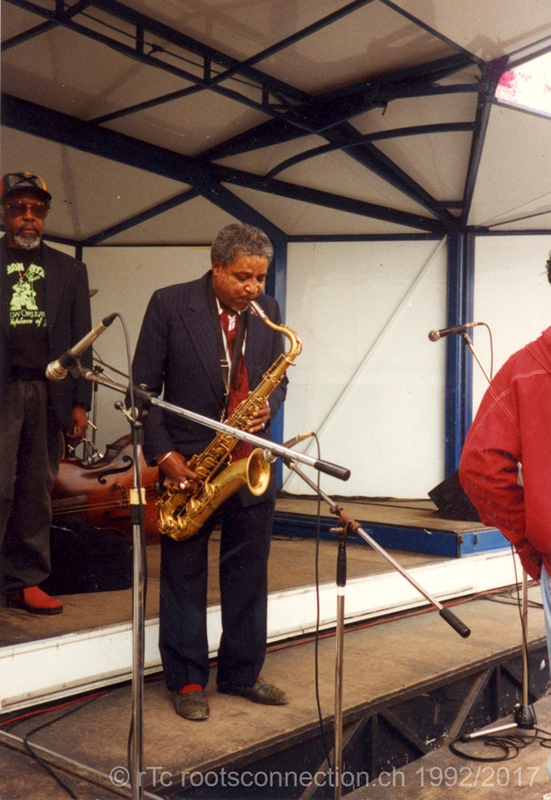 The next sound check tune was Love & Affection by Dion Knibb & The Skatalites (solo by Nathan Breedlove, harmony vocals by Lloyd Knibb). Meanwhile more people came to that stage, they had no idea, that this is still the sound check. Tommy had to tell them. Tommy McCook announced to the now bigger audience, that this is still sound check and the band will be back on stage soon. Then it was stage time. This is the full program of the concert and my comments on the DAT cover. Yes, there was no encore. It was a job. The audience was great, but only a few hundred. I was free to dance, because my DAT was recording on stage. I was hopping around like fully crazy. But, I was sick with Ska fever. That was insane. 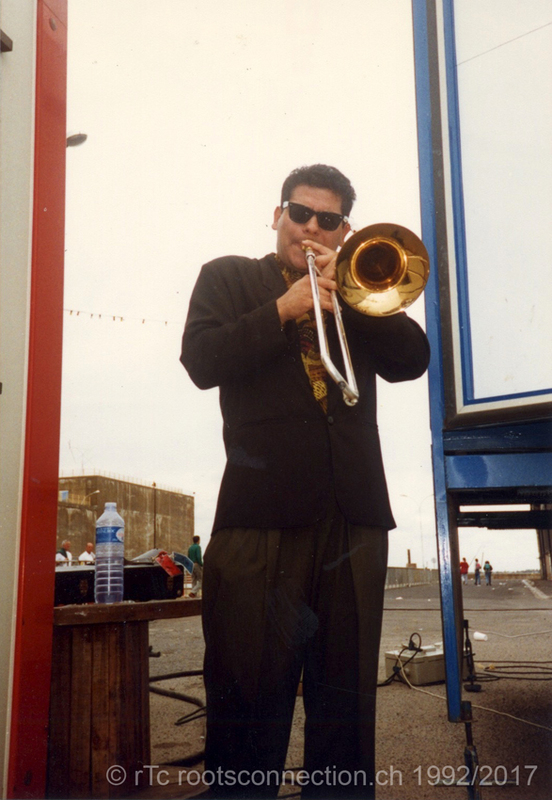 It was like an injection of Ska. 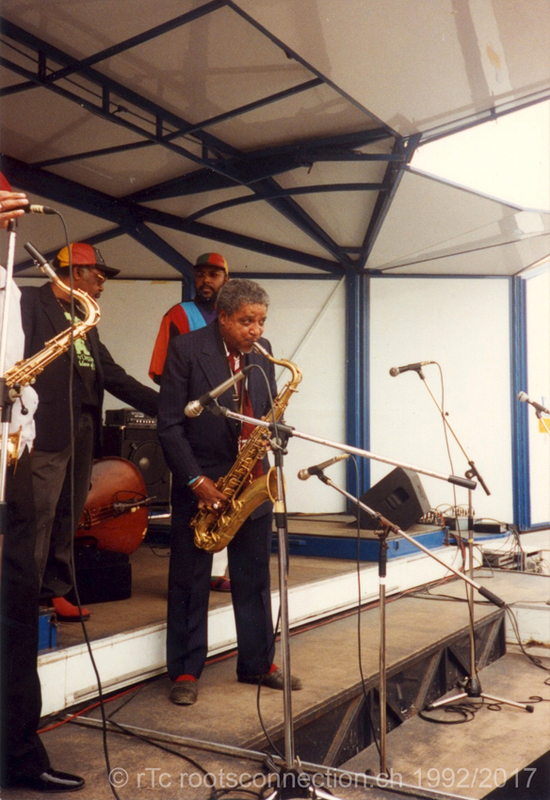 A maximum dose of Skatalites. When you keep a look on Tommy and Rolando, maybe you’ll overstand it. But with Knibb and Brevett there was no chance to keep cool. I enjoyed it as much as possible. That was MY show. It was like, the full band was just playing for me. First: I had some time with each of them before. Second: Everybody knew, I was driving 600 miles to see them playing. Third: They all saw me dancing like hell in the audience. Fourth: I was recording the whole thing and nobody knew about that. Please don’t tell anyone. And last but not least, I love the Skatalites music since I first heard them in 1986 and never stopped loving their music. After the show, Dion came to me with two nice French ladies. I was quite useful with my French. 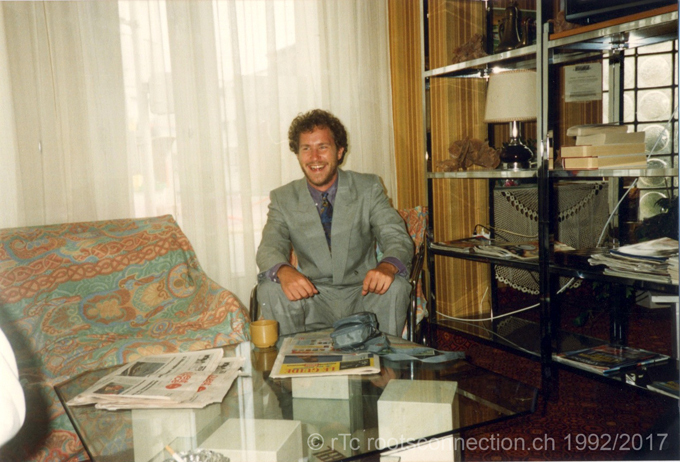 I was very comfortable with Dion, personally I was too shy to talk to foreigners, but with Dion’s help it was more than easy. 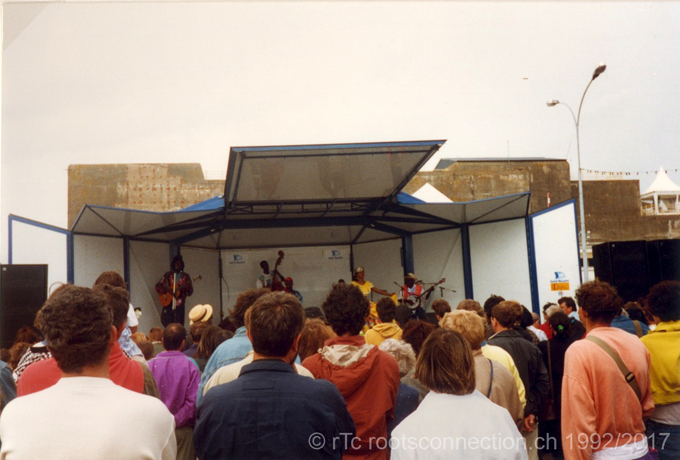 And then there started another concert, just on a big outdoor stage aside. The Fab 5 played some nice Reggae to the thankful audience. It was a huge audience (a few thousands). Dion told me and the two ladies that he will go on stage and sing with them. I said, that he must be crazy and won’t do that. I translated to the ladies, and they were laughing. Dion went on stage, very cool, very great and get a microphone and jammed with the Fab 5. What a great moment. Then he came back to us. We three gave him an extra applause for his great performance. It seemed, that this was his daily business. He just laughed. Then it was time to go back to the hotel. I heard, that Luis and Nathan were jamming somewhere inside the festival. It was almost too much for me, I was very tired (only changing from French to English all the time was heavy, but also all this new experience and that upliftment by the music, it was almost too much). 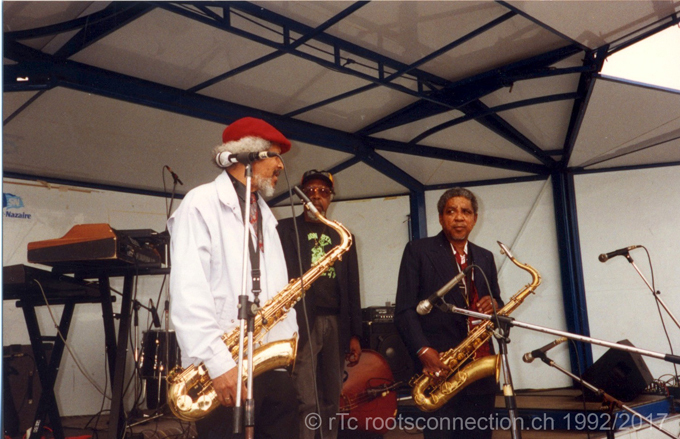 I was lucky to go back with the Skatalites. At the hotel, Rolando asked me, if I would like to go eating with him. Lloyd Knibb, Brevett, Dion, Cary, Devon James and Rolando came with me for diner in a restaurant. Brevett said, that wind is worse than fire and water worse than wind. It was about Revelation 14 and the bloody steak. I remember, that Brevett asked for a steak well done, and Cary helped me to order the right fish for Dion. But when Brevett get his steak it was bloody, he refused to eat that. I told the waiter, to take back that steak because it is not well done. But after a while he came back, and still there was blood running out of it. My steak was better, so I changed with Brevett the steak, he was very happy and thankful. Rolando Alphonso was eating carefully and peaceful. 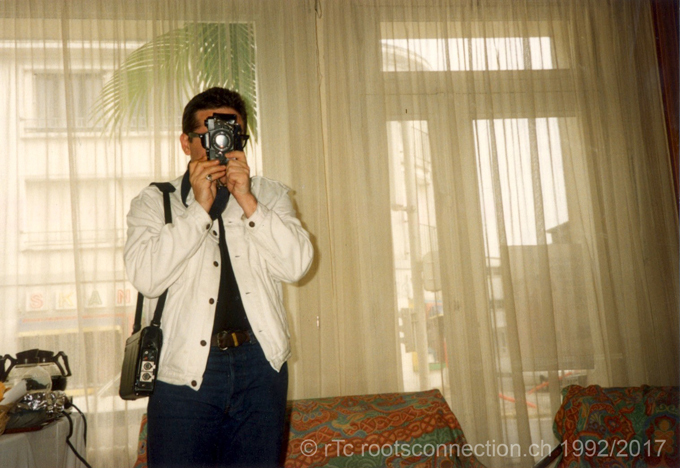 Then we went back to the hotel, where Rolando and Lloyd Brevett shared one room. They asked me to come with them. I was there, when Brevett gave me that CD from Japan (more details on discorgs). I asked him to sign it. And then Rolando too. Then I said to Lloyd Brevett, that I should ask Lloyd Knibb and Tommy McCook too, to sign it, but Brevett didn’t found this a good idea. He said, Tommy don’t know about this release. We’ve kept on chatting for a while, it wasn’t late yet, the show was finished after noon. Tomorrow will be the last day of this first meeting. Just time enough to say good-bye. In 1993 I will meet them again. 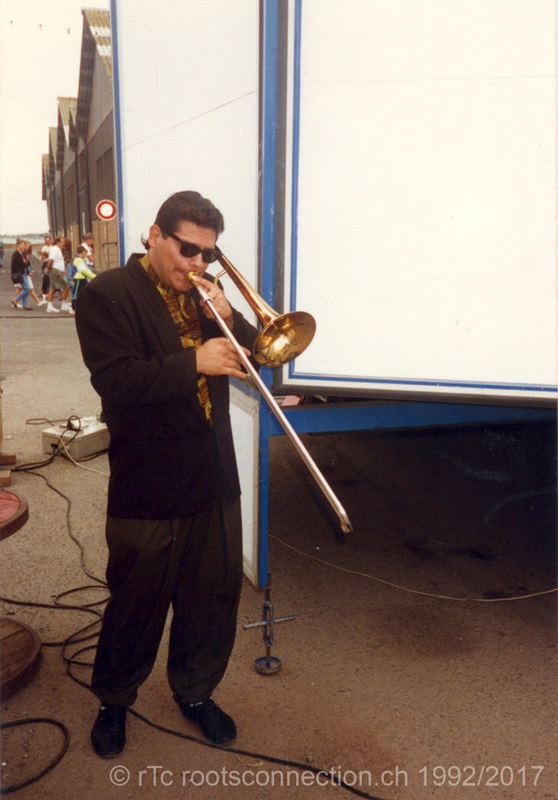 Luis and Cary won’t be with them anymore, but I have met both again in Switzerland a few years later (Cary Brown with the New York Ska-Jazz Ensemble in Zurich and Luis Bonilla with Lester Bowie’s Brass Phantasy at Jazz Festival 1994 in Willisau, Steve Turre was also in the band stand). Only Dion Knibb I haven’t met again since those days. CARA!!! 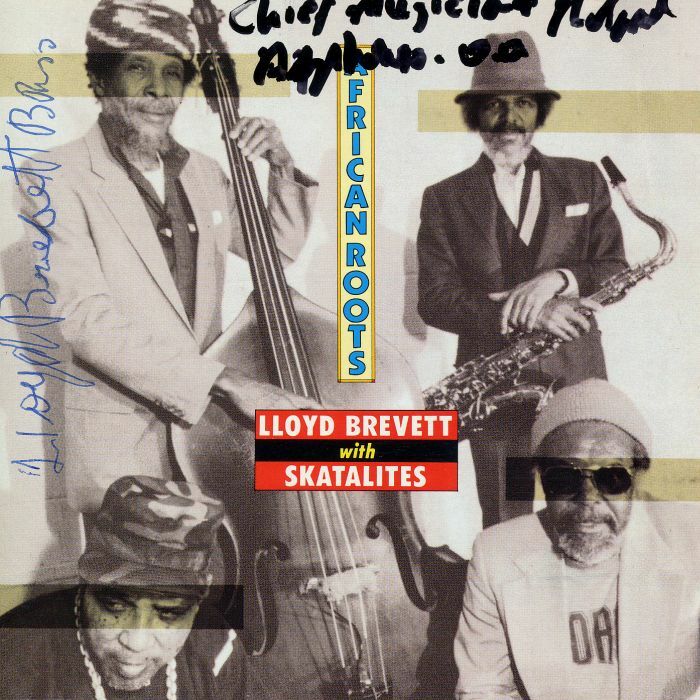 !muito bons esses audios dos the skatalites, a minha melhor banda!!! !estou ansioso para que vocé poste recordações desse mesmo show das musicas:the man in the street,guns of navarone e el pussycat!!! !mal posso esperar para ouvir esses jingles maravilhosos!! !MUITO,MUITO,MUITO BOM!!!! cara,se vc fez a gravação de todo o show,não convenhava postar todas as faixas do show? ?ja tem a lista!estou no aguardo!